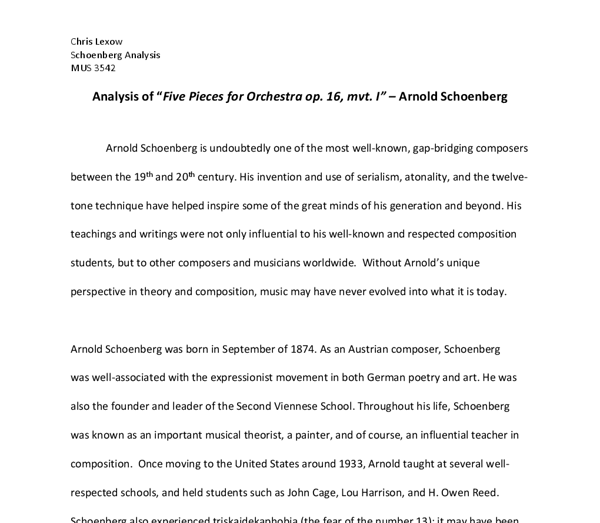 ﻿Chris Lexow Schoenberg Analysis MUS 3542 Analysis of ?Five Pieces for Orchestra op. 16, mvt. I? ? Arnold Schoenberg Arnold Schoenberg is undoubtedly one of the most well-known, gap-bridging composers between the 19th and 20th century. His invention and use of serialism, atonality, and the twelve-tone technique have helped inspire some of the great minds of his generation and beyond. His teachings and writings were not only influential to his well-known and respected composition students, but to other composers and musicians worldwide. Without Arnold?s unique perspective in theory and composition, music may have never evolved into what it is today. Arnold Schoenberg was born in September of 1874. As an Austrian composer, Schoenberg was well-associated with the expressionist movement in both German poetry and art. He was also the founder and leader of the Second Viennese School. Throughout his life, Schoenberg was known as an important musical theorist, a painter, and of course, an influential teacher in composition. Once moving to the United States around 1933, Arnold taught at several well-respected schools, and held students such as John Cage, Lou Harrison, and H. Owen Reed. Schoenberg also experienced triskaidekaphobia (the fear of the number 13); it may have been his superstitious nature that killed him. ...read more. 1-3; mvt. 1 (Vorgefuhle) op. 16 Schoenberg This figure is consistently restated throughout the movement in several different transpositions and instruments. Together with the clarinets and horns repeating a similar melody in measures 4-6, prime sets such as (015), (016) and (024)) are found. As this is in response to the Violoncello melody found in measures 1-3, we label these all together as ?Theme 1?, with a prime form of (0156); which in its entirety can be found in measures 1-6 of the first movement. ?Theme 2? is stated shortly after in the following measures of 7-9 in the double bass as seen below: Figure 2: m.7-9; mvt. 1 (Vorgefuhle) op. 16 Schoenberg While this second theme is not very prominent in the initial exposition, it makes a larger appearance later on in the movement after the development. As Schoenberg introduces both of these themes, he uses special techniques to alter and develop them, to create the direction of the movement moving forward. One of the most common techniques at work is the Klangfarbenmelodie. In short, this musical technique is used to distribute a melodic element or motive throughout several instruments rather than one, therefore adding timbre and texture to the main motive. ...read more. Continuing with an (015) pedal now found in the trombones, the harp also enters with a very unique ostinato. Final Section This last section is spilt in half. Just like the original exposition (m. 1-26), the fourth section begins with variations and restatements of Theme 1 (0156). This continues on until measure 120, where a sudden but expected switch is made to Theme 2 (0157). 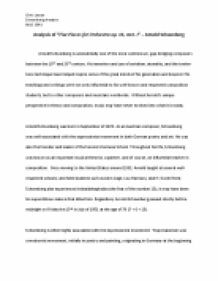 Again, these final eight measures are filled with variations and restatements of Theme 2 (0157) until the end of the movement (m. 128). At measure 124, the ostinato that was found in the harp switches to violoncello and the double bass. This gains intensity through the last few measures to end the movement. Just like the end of the development, this fourth and final section is also ended with a flutter tongue in the last two measures, found in the (015) pedal tone in the low brass. It is very clear that this movement not only has structure, but also a unique contextual form. Schoenberg?s style of writing was nothing short of brilliant and concise. Combining pitch class sets with rhythmic and motivic elements such as musical prose and stratification is a very different style of writing, but takes just as much time and technique as Mozart writing a symphony, which makes it equally as brilliant. ...read more. This student written piece of work is one of many that can be found in our University Degree Music section. The kitchen, a 'realist text' is written by Arnold Wesker, a 'naturalistic writer'. continues the strategy used at the beginning of chorus two. Measure 53 is a melodic sequence based on the figure in measure 20. The continuity of chorus two is complete with the use of nine and eleven extensions of E dorian in a descending then ascending triad (D major). 4 From these split opinions it is already clear that there is something different about this third symphony. The modulations are described as 'strange' and the transitions 'violent', something that is 'a true if not desirable originality' in the first written review from 17th April 1805. An MP3 can by encoded as a constant bit rate which stands for the number of bit of data for 1 second of audio. However the newer MP3s can be encoded as a variable bit rate which means that when not much is happening in the track (e.g. FUTURISTIC MINDS: GILLESPIE &amp;amp; McLAUGHLIN Essay on the development of jazz. Microphones - different types and their uses in performances. When the plates are further apart, capacitance decreases and a discharge current occurs.' (Condenser Microphones) The diagram here shows the process: (http://www.mediacollege.com/audio/images/mic-condenser.gif) Condenser microphones require a power source, such as a battery or phantom power. This means that the audio signal they capture is stronger than one captured from a Dynamic microphone. Looking for expert help with your Creative Arts and Design work?